Are you interested in writing a thesis in our Honors Program in English, but don't really know what it entails? Do you want more information on the application process, mentorship, or Honors Seminar? 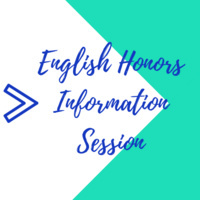 Would you like to speak to current Honors students to hear the real deal about the Honors Program in English? Join us for an information session next Friday, November 16th from 4:00-5:30 pm in New North 311. We will not only explain the application process, the Honors Seminar, and other nuts-and-bolts issues, but also discuss why one might want to do an Honors thesis project in the first place! Current students enrolled in the English Honors Program will be on hand to share their experiences and describe their projects. Both creative and critical projects will be discussed. FREE PIZZA and soda -- don't miss this opportunity to find out more about the English Honors Program!